Olive oil and extra virgin olive oil can be used for pan and deep frying. So, what happens when you have lots of olive oil left over in the pan after you’re done cooking? Each time any oil is heated and cooled, it loses flavor, freshness, and health benefits. 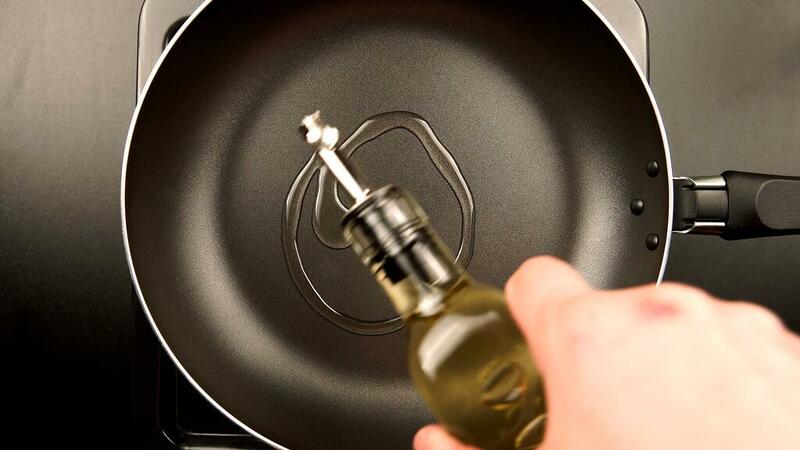 The oil begins to deteriorate, and the smoke point also decreases, making it more difficult to cook with. However, it is also very expensive to replace your oil all the time. This is especially true of those who deep fry foods, as that cooking process tends to use a lot of oil. Unlike many other oils, it is safe to reuse olive oil. A study from the American Chemical Society’s Journal of Agricultural and Food Chemistry has found that olive oil has the greatest resistance to oxidative deterioration, so it will last longer than other oils. Furthermore, it was found to have the least amount of harmful contents after being heated and cooled repeatedly. Olive oil is also more heart-healthy than most cooking oils. The high percentage of mono-unsaturated fat makes olive oil a good choice for frying. If you are looking to reuse your olive oil, there are a few factors to consider. Olive oil may retain some of the flavor from the previously cooked food, so it’s best to keep that in mind when using it to cook again. Like all olive oil, store the used oil in a cool, dark place and use it quickly.